Assess the quality of the Input RNA by running the RNA sample on an Agilent Bioanalyzer® RNA 6000 Nano/Pico Chip. For PolyA mRNA enrichment, high quality RNA with a RIN score > 7 is required. Input Amount Requirement: 10 ng–1 µg total RNA quantified by Qubit® Fluorometer and quality checked by Bioanalyzer. The protocol is optimized for approximately 200 bp RNA inserts. To generate libraries with longer RNA insert sizes, refer to Appendix A (Chapter 6) for recommended fragmentation times and size selection conditions. Keep all the buffers on ice, unless otherwise indicated. 1.1.2. Mix thoroughly by pipetting up and down several times. Note: Keep the mix on ice until mRNA is purified. It will be used in Step 1.2.36 and 1.2.39. 1.2.1. Dilute the total RNA with nuclease-free water to a final volume of 50 μl in a nuclease-free 0.2 ml PCR tube and keep on ice. 1.2.2. To wash the Oligo dT Beads, add the following to a 1.5 ml nuclease-free tube. If preparing multiple libraries, beads for up to 10 samples can be added to a single 1.5 ml tube for subsequent washes. 1.2.3. Wash the beads by pipetting up and down several times. 1.2.4. Place the tube on the magnet and incubate at room temperature until the solution is clear (~2 minutes). 1.2.5. Remove and discard all of the supernatant from the tube. Take care not to disturb the beads. 1.2.6. Remove the tube from the magnetic rack. 1.2.7. Add 100 μl RNA Binding Buffer (2X) to the beads and wash by pipetting up and down. If preparing multiple libraries, add 100 µl RNA Binding Buffer (2X) per sample. 1.2.8. Place the tubes on the magnet and incubate at room temperature until the solution is clear (~2 minutes). 1.2.9. Remove and discard the supernatant from the tube. Take care not to disturb the beads. 1.2.10. Add 50 μl RNA Binding Buffer (2X) to the beads and mix by pipetting up and down until beads are homogenous. If preparing multiple libraries, add 50 μl RNA Binding Buffer (2X) per sample. 1.2.11. Add 50 μl beads to each RNA sample from Step 1.2.1. Mix thoroughly by pipetting up and down several times. 1.2.12. Place the tube in a thermal cycler and close the lid. Heat the sample at 65°C for 5 minutes and cool to 4°C with the heated lid set at ≥ 75°C to denature the RNA and facilitate binding of the mRNA to the beads. 1.2.13. Remove the tube from the thermal cycler when the temperature reaches 4°C. 1.2.14. Mix thoroughly by pipetting up and down several times. Place the tube on the bench and incubate at room temperature for 5 minutes to allow the mRNA to bind to the beads. 1.2.15. Place the tube on the magnetic rack at room temperature until the solution is clear (~2 minutes). 1.2.16. Remove and discard all of the supernatant. Take care not to disturb the beads. 1.2.17. Remove the tube from the magnetic rack. 1.2.18. Wash the beads by adding 200 μl of Wash Buffer to the tube to remove unbound RNA. Gently pipette the entire volume up and down 6 times to mix thoroughly. 1.2.19. Place the tube on the magnetic rack at room temperature until the solution is clear (~2 minutes). 1.2.20. Remove and discard all of the supernatant from the tube. Take care not to disturb the beads. 1.2.21. Remove the tube from the magnetic rack. 1.2.23. Add 50 μl of Tris Buffer (provided) to each tube. Gently pipette up and down 6 times to mix thoroughly. 1.2.24. Place the tube on the thermal cycler. Close the lid and heat the samples at 80°C for 2 minutes, then hold at 25°C with the heated lid set at ≥ 90°C to do the first elution of the mRNA from the beads. 1.2.25. Remove the tube from the thermal cycler when the temperature reaches 25°C. 1.2.26. Add 50 μl of RNA Binding Buffer (2X) to the sample to allow the mRNA to re-bind to the beads. Mix thoroughly by gently pipetting up and down several times. 1.2.27. Incubate the tube at room temperature for 5 minutes. 1.2.28. Place the tube on the magnetic rack at room temperature until the solution is clear (~2 minutes). 1.2.29. Remove and discard the supernatant from the tube. Take care not to disturb the beads. 1.2.30. Remove the tube from the magnetic rack. 1.2.31. Wash the beads by adding 200 μl of Wash Buffer. Gently pipette the entire volume up and down 6 times to mix thoroughly. 1.2.32. Spin down the tube briefly to collect the liquid from the wall and lid of the tube. Note: It is important to spin down the tube to prevent carryover of the Wash Buffer in subsequent steps. 1.2.33 Place the tube on the magnet at room temperature until the solution is clear (~2 minutes). 1.2.34. Remove and discard all of the supernatant from the tube. Take care not to disturb the beads that contains the mRNA. Note: It is important to remove all of the supernatant to successfully fragment the mRNA in the subsequent steps. 1.2.35. Remove the tube from the magnetic rack. The next step provides a fragmentation incubation time resulting in an RNA insert size of ~ 200 nt. For RNA insert sizes > 200 nt, refer to Chapter 6 (Appendix A) for recommended fragmentation times in Step 1.2.37. 1.2.36. To elute the mRNA from the beads and fragment, add 11.5 μl of the First Strand Synthesis Reaction Buffer and Random Primer Mix (2X) prepared in Step 1.1.2, pipette up and down several times to resuspend the beads. 1.2.38. Quickly spin down the tube in a microcentrifuge to collect the liquid from the sides of the tube and place on the magnet right away until the solution is clear (~1-2 minutes). 1.2.39. Collect the fragmented mRNA by transferring 10 μl of the supernatant to a nuclease-free 0.2 ml PCR tube. Note 1: If the supernatant volume recovered is less than 10 μl for any reason, bring the volume up to 10 μl by adding the First Strand Synthesis Reaction Buffer and Random Primer Mix (2X) prepared in Step 1.1.2 and continue with the protocol. Note 2: Avoid transferring the magnetic beads. 1.2.40. Place the tube on ice and proceed directly to First Strand cDNA Synthesis. 1.3.1. Assemble the first strand cDNA synthesis reaction on ice by adding the following components into fragmented and primed RNA from Step 1.2.40. 1.3.2. Mix thoroughly by pipetting up and down several times. 1.3.4. Immediately, perform Second Strand cDNA Synthesis. 1.4.1. Assemble the second strand cDNA synthesis reaction on ice by adding the following components into the first strand synthesis reaction product from Step 1.3.4. 1.4.2. Keeping the tube on ice, mix thoroughly by pipetting the reaction up and down several times. 1.4.3. Incubate in a thermal cycler for 1 hour at 16°C with the heated lid set at ≤ 40°C. 1.5.1. Vortex SPRIselect Beads or NEBNext Sample Purification Beads to resuspend. 1.5.2. Add 144 μl (1.8X) of resuspended beads to the second strand synthesis reaction (~80 μl). Mix well on a vortex mixer or by pipetting up and down at least 10 times. 1.5.3. Incubate for 5 minutes at room temperature. 1.5.4. Briefly spin the tube in a microcentrifuge to collect any sample from the sides of the tube. Place the tube on a magnetic rack to separate beads from the supernatant. After the solution is clear, carefully remove and discard the supernatant. Be careful not to disturb the beads, which contain DNA. 1.5.5. Add 200 μl of freshly prepared 80% ethanol to the tube while in the magnetic stand. Incubate at room temperature for 30 seconds, and then carefully remove and discard the supernatant. 1.5.6. Repeat Step 1.5.5 once for a total of 2 washing steps. 1.5.7. Air dry the beads for 5 minutes while the tube is on the magnetic rack with the lid open. 1.5.8. Remove the tube from the magnet. Elute the DNA target from the beads by adding 53 μl 0.1X TE Buffer (provided) to the beads. Mix well on a vortex mixer or by pipetting up and down several times. Briefly spin the tube and incubate for 2 minutes at room temperature. Place the tube on the magnetic rack until the solution is clear. 1.5.9. 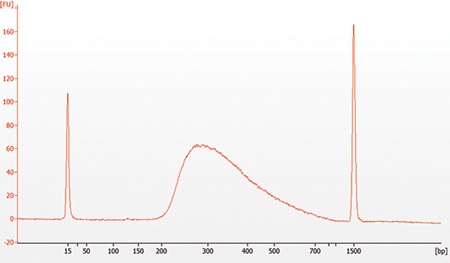 Remove 50 µl of the supernatant and transfer to a clean nuclease-free PCR tube. 1.6.1. Assemble the end prep reaction on ice by adding the following components to second strand synthesis product from Step 1.5.9. 1.6.2 Set a 100 μl or 200 μl pipette to 50 μl and then pipette the entire volume up and down at least 10 times to mix thoroughly. Perform a quick spin to collect all liquid from the sides of the tube. 1.6.4. Proceed immediately to Adaptor Ligation. 1.7.1. Dilute the (red) NEBNext Adaptor* prior to setting up the ligation reaction in ice-cold Adaptor Dilution Buffer and keep the diluted adaptor on ice. 1.7.2. Assemble the ligation reaction on ice by adding the following components, in the order given, to the end prep reaction product from Step 1.6.4. 1.7.3. Set a 100 μl or 200 μl pipette to 80 μl and then pipette the entire volume up and down at least 10 times to mix thoroughly. Perform a quick spin to collect all liquid from the sides of the tube. 1.7.4. Incubate 15 minutes at 20°C in a thermal cycler. 1.7.5 Add 3 μl (red) USER Enzyme to the ligation mixture from Step 1.7.4, resulting in total volume of 96.5 μl. Note: Steps 1.7.5 and 1.7.6 are only required for use with NEBNext Adaptors. USER enzyme can be found in the NEBNext Singleplex (NEB #E7350) or Multiplex (NEB #E7335, #E7500, #E7710, #E7730, #E6609 or #E7600) Oligos for Illumina. 1.7.6 Mix well and incubate at 37°C for 15 minutes with the heated lid set to ≥ 45°C. 1.7.7 Proceed immediately to Purification of the Ligation Reaction. 1.8.1. Add 87 μl (0.9X) resuspended SPRIselect Beads or NEBNext Sample Purification Beads and mix well on a vortex mixer or by pipetting up and down at least 10 times. 1.8.2. Incubate for 5 minutes at room temperature. 1.8.3. Quickly spin the tube in a microcentrifuge and place the tube on an appropriate magnetic rack to separate beads from the supernatant. After the solution is clear (~ 5 minutes), discard the supernatant that contain unwanted fragments (Caution: do not discard the beads). 1.8.4. Add 200 μl of freshly prepared 80% ethanol to the tube while in the magnetic rack. Incubate at room temperature for 30 seconds, and then carefully remove and discard the supernatant. 1.8.5. Repeat Step 1.8.4 once for a total of 2 washing steps. 1.8.6. Briefly spin the tube, and put the tube back in the magnetic rack. 1.8.7. Completely remove the residual ethanol, and air dry beads until the beads are dry for 5 minutes while the tube is on the magnetic rack with the lid open. 1.8.8. Remove the tube from the magnet. Elute DNA target from the beads by adding 17 μl 0.1X TE (provided) to the beads. Mix well on a vortex mixer or by pipetting up and down. Quickly spin the tube and incubate for 2 minutes at room temperature. Put the tube in the magnetic rack until the solution is clear. 1.8.9. Without disturbing the bead pellet, transfer 15 μl of the supernatant to a clean PCR tube and proceed to PCR enrichment. Follow Section 1.9.1B if you are using NEBNext Multiplex Oligos for Illumina (96 Index Primers, NEB #E6609). 1.9.1. Set up the PCR reaction as described below based on the type of oligos (PCR primers) used. 1.9.2. Mix well by gently pipetting up and down 10 times. Quickly spin the tube in a microcentrifuge. * The number of PCR cycles should be adjusted based on RNA input (Table 1.9.3B). ** It is important to limit the number of PCR cycles to avoid overamplification. 1.10.1. Vortex SPRIselect Beads or NEBNext Sample Purification Beads to resuspend. 1.10.2. Add 45 μl (0.9X) of resuspended beads to the PCR reaction (~ 50 μl). Mix well on a vortex mixer or by pipetting up and down at least 10 times. 1.10.3. Incubate for 5 minutes at room temperature. 1.10.4. Quickly spin the tube in a microcentrifuge and place the tube on an appropriate magnetic rack to separate beads from the supernatant. After the solution is clear (about 5 minutes), carefully remove and discard the supernatant. Be careful not to disturb the beads that contain DNA targets. 1.10.5. Add 200 μl of freshly prepared 80% ethanol to the tube while in the magnetic rack. Incubate at room temperature for 30 seconds, and then carefully remove and discard the supernatant. 1.10.6. Repeat Step 1.10.5 once for a total of 2 washing steps. 1.10.7. Air dry the beads for 5 minutes while the tube is on the magnetic rack with the lid open. 1.10.8. Remove the tube from the magnetic rack. Elute the DNA target from the beads by adding 23 μl 0.1X TE (provided) to the beads. Mix well on a vortex mixer or by pipetting up and down several times. Quickly spin the tube in a microcentrifuge and incubate for 2 minutes at room temperature. Place the tube in the magnetic rack until the solution is clear. 1.10.9. Transfer 20 μl of the supernatant to a clean PCR tube, and store at –20°C. 1.11.1. Run 1 μl library on a DNA 1000 chip. If the library yield is too low to quantify on this chip, please run the samples on a DNA High Sensitivity chip. 1.11.3. Check that the electropherogram shows a narrow distribution with a peak size approximately 300 bp. Note: If a peak at ~ 80 bp (primers) or 128 bp (adaptor-dimer) is visible in the Bioanalyzer traces, bring up the sample volume (from Step 1.10.9) to 50 μl with 0.1X TE buffer and repeat the SPRIselect Bead or NEBNext Sample Purification Bead Cleanup Step (Section 1.10). Figure 1.11.1: Example of RNA library size distribution on a Bioanalyzer.